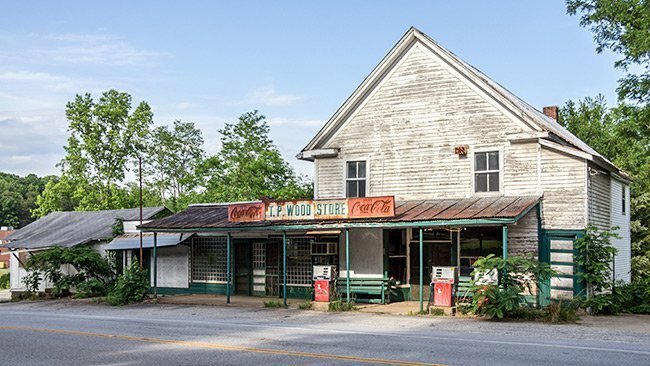 This historic general store in the community of Tigerville has been operating since at least 1881. That year, Tigerville’s first post office opened in the store with proprietor Lemuel Jennings serving as post master. The store later came under the ownership of the Wood family, who operated it for much of the twentieth century; it continued to house the post office. In its latter years it was known as the T.P. Wood Store. Owner Thornton Pralo Wood, a Greenville County deputy sheriff who retired in 1964, ran the store with his son, Willie, and his wife, Helen, who also acted as post mistress. A Masonic lodge met in the store’s second floor. Sadly, Helen Wood was murdered in the store in 1981 by Dale Robert Yates and Henry Davis during a robbery. Pralo Wood died in 1995, and Willie Wood closed the store and posit office in 1996. 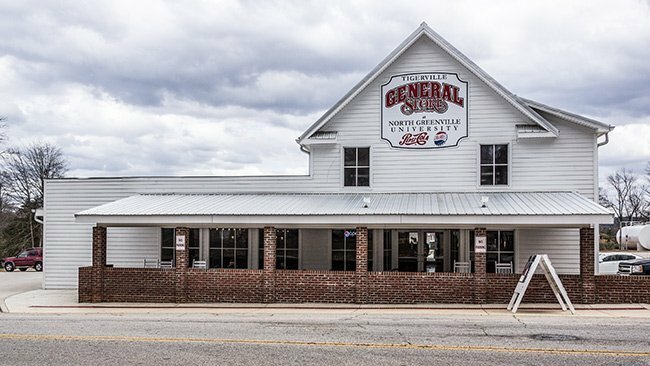 The vacant store that had been the heart of Tigerville’s informal social circle was purchased by North Greenville University in recent years. The university restored the old building to once again function as a store. 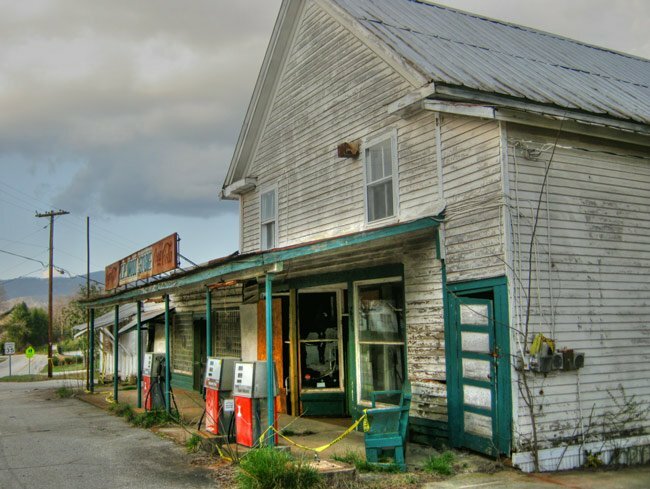 Now called Tigerville General Store, the store stocks basic groceries for students attending the Upstate college located across the street. It also includes a Papa John’s pizzeria with seating and wireless connection for study space. Students also have opportunities to work at the Tigerville Country Store, which opened under its new guise in 2015. The restaurant that is there and still operating is now called Thai and I and serving southern classic american food. At least far as I know. Does anyone know what happened to the family restaurant called “All in the Family” that was to the left of T.P. Wood General Store? My roommates and I ate there a least every other week during my 2 years on campus, from 1979 to 1981. Thank you for the correction, Sandra, and for sharing your story. Sadly, I was a student at North Greenville Junior College, when Mrs. Woods was murdered during the above mentioned armed robbery. But the robbery and murder happened in 1981, and not 1991. By the time I was heading to the dinning hall for supper around 5 pm, was when I heard the news about the robbery and murder at the store. I was around 20 at the time, and now about to turn 55, and the murder of Mrs. Woods, is not something I will ever forget.